Charles Richard Ogden Evans was born in Canada in 1824, the second son of Thomas Evans and Harriet Ogden. His father’s military career took him to many places and it is not clear where and how Charles was brought up. He spent his very early years in Canada and some time in Ireland too. His father held the post of military commander in Gibraltar (1834-36) and then Malta (1836-38) so presumably was not a strong presence for long periods. His father’s distinguished career is recorded in the Dictionary of Canadian Biography. Both Charles and his elder brother, Thomas, chose military careers. We still have all Charles’s commissioning papers in the Royal Artillery through the ranks from 1844 to 1870. Just like his father he was to attain the rank of General at the very end of his career. His brother Thomas was killed in India in 1843. He also had a younger brother Richard John Evans who served eighteen years in the army before returning to a business career in Toronto. Charles married Sarah Evans his cousin in 1856. She was in fact the daughter of his father’s nephew Richard Evans back in England. They were married in Tettenhall but did not have any children. In the 1881 census Sarah is living with her brother Henry and she is described as “General Officer’s Wife”. They adopted the orphaned daughter of Charles’s niece called Edith Ogden (Aunt Og). Og was born in Allahabad in India (Royal Artillery HQ) but her mother died shortly after her birth. Og’s father seems to have remarried fairly rapidly in India and the baby must have been shipped home to Charles and Sarah in England. The London Gazette announced that Charles retired with the honorary rank of Lieutenant General on 28 Mar 1883. We have a passport for Brigadier-General Evans of the 1880’s that shows that the family travelled as a unit abroad. They also spent time in Ireland, where there were still strong family connections. Charles died in Eastbourne in April 1890. Other artefacts we have that appear to be his are a series of buttons – one set inscribed the ‘Montreal Hunt’. The commissioning papers have been scanned and will be put up later. There are also two large vellum documents appointing Lieutenant Colonel Charles R O Evans to the “Commission of the Peace” in Limerick dated 1867. 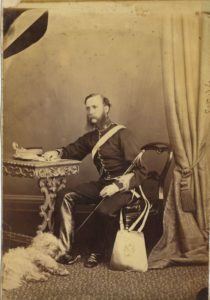 The inherited picture of his father, also Lieutenant General Evans, must probably come through the house in Eastbourne.